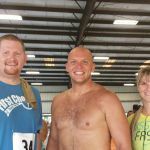 Congratulations to Brent, Stephen and Carrie for finishing the Possum Trot 5k this past Saturday. Carrie was a former patient of ours who was working hard to get back to running. Stephen finished with a time of 33:16. Carrie and Brent both came in third in their age groups. Brent finished with a time of 27:10. Brent thought he had a better chance to catch a possum if he took his shirt off. Congratulations to these guys!